An ore smelter that bellowed smoke over Mariana Chew’s elementary school in the border town of Ciudad Juarez set the course of her life. Located across the border in El Paso,112-year old lead and copper producing facility sickened her as a child. The smoke gave the children in Chew’s school burning eyes, asthma, allergies and other illnesses, she said. Years passed, but anger at the smelter drove Chew, now 43, to seek a doctorate in environmental science at the University of Texas. She was armed with scientific knowledge when she attended often contentious meetings about the smelter, which is owned by a company called ASARCO. She said company representatives and Texas environmental protection officials often dismissed the complaints of border residents, who are largely Hispanic. Chew, a single mother of two teen-aged daughters, is part of a unique community-based environmental movement that has struggled for recognition for years. The Latino environmental justice movement is waging David vs. Goliath fights everywhere, in battlegrounds as diverse as the U.S.-Mexico border, East Los Angeles and Brooklyn, N.Y. 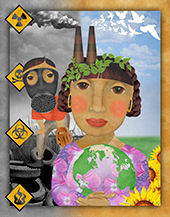 The environmental justice movement fights against the disproportionate impact of pollution on minorities and the poor. Its activists are also concerned with the unequal distribution of clean water and other resources, parkland and open spaces.The movement has logged some impressive wins. It has also captured the attention of mainstream environmental groups like the Sierra Club, and Audubon Society, which have scrambled in recent years to recruit Hispanics and other minorities and create their own environmental justice programs. The Sierra Club recruited Chew in its fight against the smelter. She was designated the organization’s “associate regional representative,” representing the Sierra Club at public meetings and collecting soil samples to help it prove the smelter’s toxicity.But Chew concedes a cultural barrier remains between mainstream groups and the disadvantaged who live and work in the world’s most toxic places. She said the Sierra Club sometimes “didn’t understand the environmental justice component” of the war on pollution. Restarting the smelter (below) would result in new jobs for economically strapped border communities so many El Paso residents rallied around ASARCO. The mostly white middle-class and upper- middle members of the big green groups sometimes fail to understand the poor’s economic dependence on dirty jobs. Elizabeth Yeampierre, a civil rights attorney and environmental activist in Brooklyn’ s Red Hook neighborhood, said mainstream environmental groups often tried to impose their solutions on poor communities without knowing the complexities of their problems. ASARCO temporarily shut the El Paso smelter in 1999. But in 2002 it began the process of opening up again. Chew, who had moved to El Paso, helped mobilize her neighbors to keep smelter closed for good. When the Texas Commission on Environmental Quality gave ASARCO an air quality permit, border residents lobbied New Mexico Environment Secretary Ron Curry to get involved in the dispute because much of the smelter’s emissions would drift into his state. Chew and other activists also asked the U.S. Environmental Protection Agency to help. Last year, ASARCO announced it had abandoned all attempts to start up the plant, citing the recession’s “extreme economic conditions.” But Chew and many others say it was local success in prodding the Obama administration EPA into action that sealed the plant’s fate. ASARCO attorney Doug McAllister declined to comment for this article. “It was a long and complex situation,” he said. In Brooklyn, Yeampierre is hoping for a similar win. The executive director of the United Puerto Rican Organization of Sunset Park, or UPROSE, Yeampierre is focusing her energy on what she calls “one of the dirtiest highways in America,” the Gowanus Expressway that carries nearly 200,000 vehicles through her neighborhood every day. “If someone puts a white lawn chair out in the morning, by evening that chair is black,” she said. UPROSE is part of a diverse coalition that is seeking to replace the crumbling elevated highway built in the 1930s with a tunnel. It has also helped block the construction of a new power plant in the neighborhood, spearheaded a successful campaign to eliminate lead paint from the area’s homes and is pushing for the cleanup of dozens of “brownfields,” or contaminated sites in Red Hook and Sunset Park. Yeampierre said she would appreciate help from well-funded, mainstream environmental groups. But she distrusts their agendas. As a step toward fighting global warming, President Obama and congressional Democrats have supported cap and trade, which would allow utilities with better-than-mandated quality standards to sell leftover allowances to other facilities. The Sierra Club, Audubon Society and other mainstream environmental groups support the policy. But environmental justice advocates are concerned plants in their neighborhoods would buy up the allowances in order to avoid cleaning up their facilities. The placement of polluting plants and factories in low-income areas is well documented and Latinos know they live and work near health hazards. A 2008 national poll of Hispanics by Bendixen & Associates for the Sierra Club found 66 percent of the Latinos surveyed said they were aware of a toxic site---such as a refinery, chemical plant or incinerator---near their home or workplace. While UPROSE is well-established, founded in 1966 as a social and civil rights organization, many Latino green groups are much newer and smaller. Arturo Uribe, 39, formed the Mesquite Community Action Committee in rural New Mexico with members of his family and a few neighbors. It has taken on the Helena Chemical Company facility that was next to Uribe’s home, built in the 1930s by his Mexican immigrant grandparents. Uribe said his son Mariano, who was born in 2004, suffered respiratory arrest soon after coming home from the hospital. Doctors prescribed a nebulizer for little Mariano. In talking to neighbors who were concerned about his baby, Uribe was surprised to find out many people in Mesquite suffered from respiratory problems and used nebulizers. “I kept running into people who said “Oh yeah, I have one of those,’” Uribe said. Concerned about Mariano, his 14-year-old daughter ‘s frequent nosebleeds, and his ailing neighbors, Uribe and other Mesquite residents filed a lawsuit last year alleging negligence by Helena. The lawsuit said fertilizer blending operations at the facility are to blame for the respiratory problems of the town’s citizens. It cited a number of violations leveled at Helena by the New Mexico Environment Department. Helena agreed to pay $208,331 to settle those violations last year, but also filed a lawsuit against Uribe accusing him of libel and defamation. “Helena believes those statements hurt its reputation,” said Robert Soza, an attorney who represents the chemical company. “And that impacts its operations.” Soza also said Helena has tried “for the last five or six years to make right” the problems identified at the company by the New Mexico Environment Department. Uribe calls the defamation case “a textbook slapsuit” aimed at silencing him. But he said he won’t quit and is preparing for his group’s next project: the possible environmental damage caused by nearby dairy farms. Uribe acknowledges that environmental activism is new in many Latino communities. He also said that historically, there have been socio-economic and cultural barriers keeping Hispanics absent from leadership positions and membership rolls of the big green groups.But Uribe said Hispanics are becoming increasingly involved in their community. “ And the reason things are changing is that Latinos are learning the power of the vote,” he said. The truth is there’s a historic divide between Latinos and mainstream environmentalists and low level of participation of Hispanics in traditional green groups. There are many reasons for this. One is that new Latino immigrants often feel powerless and detached from an unfamiliar U.S. culture. Another is that many low-income Latinos are too busy making ends meet, sometimes juggling two or more jobs, to have time to join environmental groups or become activists. And membership fees charged by some organizations are a financial barrier to many. Other reasons Latinos may have shied from mainstream green groups is that for years their leadership and most of their membership lacked was white non-Hispanic. Outreach to minorities was not a priority. That’s changed. The board of national green groups are becoming more diverse, recruitment of minorities is a priority and partnerships with environmental justice activists common. But a lingering stigma remains: the Sierra Club and other groups once lobbied for restraints on immigration to minimize overcrowding and the depletion and despoiling of natural resources. That anti-immigrant stance was discarded in 1996 by the Sierra Club and it is now “officially neutral” on the issue of the environmental impact of immigration. But distrust of the Sierra Club’s attitude toward Hispanics remained, fueled by an unsuccessful move by some Sierra Club members to force an anti-immigrant referendum in 1998. Yet the organization opposed Congress’ plans to build a border wall along much of the Rio Grande based on environmental and human rights concerns. And its 2008 poll of Hispanics and the environment is the only such survey of Latino attitudes. The poll found that 83 percent of the respondents said environmental and energy issues impacted “a lot/some” the quality of their families’ lives and 81 percent said energy and global warming is a major problem. Oliver Bernstein, a Sierra Club environmental justice organizer, said the Sierra Club is committed to identify cultural and other barriers which discourage participation by people “who differ from our current profile” to make them feel welcome. The National Audubon Society has also tried to diversify its ranks and operations, creating some new wildlife preserves in areas with high number of minority residents. One is De’s Park in East Los Angeles that was opened last year and whose motto is “nature is closer than you think.” Another is Rio Salado in South Phoenix, opened about five years ago. “Our goal is to create the most diverse conservation community,” said Judy Braus, the Audubon’s vice president of education and centers. But Braus said the Audubon Society faced cultural barriers it tried to establish nature centers in the Latino neighborhoods.“These places weren’t very friendly or engaging, so we worked with local groups,” Braus said. One local group that helped bridge differences was Mothers of East L.A., an anti-gang organization that appreciated the value of a safe, healthy place for children to play. Like many Hispanic groups formed to address issues other than the environment, Mothers of East L.A. has entered the environmental justice movement with a campaign against the proposed construction of a new power plant in the neighborhood. Roger Rivera, 52, was introduced to the world of national environmental politics in 1988 when he worked as an outreach coordinator for Democrat Michael Dukakis’ failed presidential campaign. He noticed how few Latinos were involved in the big green groups, and how little the major Latino groups, like the National Council of La Raza, the Mexican American Legal Defense and Educational Fund and the League of United Latin American Citizens, were involved in green issues. “We were not at the environmental decision-making table,” he said. To remedy the situation, Rivera, a New Yorker born of a Cuban mother and Puerto Rican father, established the first Latino national environmental group, the National Hispanic Environmental Council, in 1996. “We’re a green group made up of brown people,” he said. Rivera’s council now has 6,000 to 7,000 members. It trains Latino youth in environmental issues and coordinates with national Latino organizations. His latest project is “to open the door to the new clean, green economy” for Latinos. He’s concerned that the billions of federal dollars for green research and development won’t flow to Hispanic-serving colleges, but to Harvard, Stanford and other top schools where Hispanics are a minority. Rivera is also concerned that Latino businesses and environmental scientists and engineers won’t benefit from the multi-billion dollar federal campaign against climate change. “People of color have never gotten a fair share of anything,” he said. Rivera hopes to change that, with the help of some of the big, national Hispanic groups. NCLR has already launched a $3 million campaign to train Latinos for green jobs. “There are huge economic reasons to work for the environment,” Rivera said. Charito Kruvant, co-author of Hispanics Living Green, a collection of essays from more than a dozen Latino environmental justice activists, said respect for nature is integral to Hispanic culture. The Bolivian-born Kruvant, 64, said the time is ripe now for those cultural values to propel Hispanics towards more activism. Ana Radelat is a Contributing Editor to LATINO.